Home » Featured » Smurf’s Up at Rainbow Beach…..
Smurf’s Up at Rainbow Beach….. 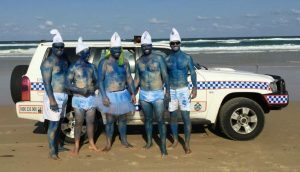 There are some things that just can’t be believed without photographic evidence…which is why when I saw a bunch of smurfs at Inskip recently, I made sure to take this photograph – who would have believed it otherwise? Unfortunately, only two hundred metres further along the beach I came across the Inskip Point equivalent of Gargamel – a grumpy Nissan Patrol-driving pest who seemed intent on disrupting everyone else’s day at the beach. This guy had already made his debut on the Facebook page I got bogged at Inskip Point – by deliberately driving his car into the old sinkhole where it stalled and filled up with water. Initially it looked set to become yet another Pelican Bay shipping hazard, until a passer-by winched it out. 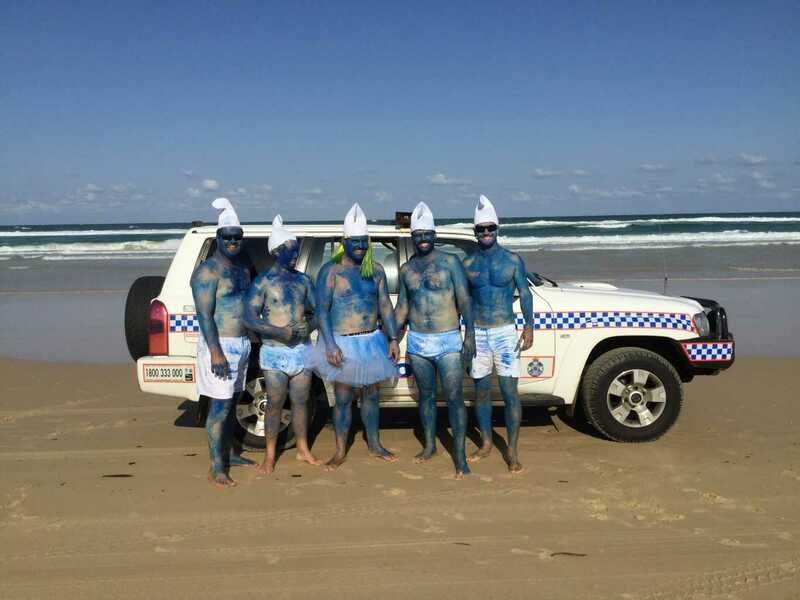 Not content with this, Gargamel somehow managed to get the old Patrol running, and proceeded to drive through the surf on his way back up the beach…which is where he was stopped for a breath test and licence check. Let’s just say that the word ‘licence’ was a foreign concept to Gargamel, who now faces a court appearance for driving without one. While pests like this become subject to penalties from a Magistrate’s Court, they would also do well to take notice of the court of public opinion – how their actions are viewed by other members of the community. They could get an insight into their unpopularity by reading the comments section on the I got bogged at Inskip Point Facebook page mentioned above. This page also recently showed the effectiveness of social media at crime prevention – with footage of a campground thief being shared and shamed. With so many mobile phones in circulation, even a remote area like Inskip Point can effectively have a network of cameras available, and such footage can be invaluable to police. So, keep your cameras at the ready; you might capture valuable information about a crime being committed, or you might get rare footage of smurfs at the beach (either of which will be loved by social media! ).